The pasta dish with chestnuts and mushrooms I cooked the other night was delicious but it left me with nearly a whole pack of ready-cooked chestnuts in my fridge, needing to be used within a week, so I had to come up with another recipe. My inspiration for the pasta dish came from Jacob Kenedy’s column in the Observer Magazine on 17 November and he also gave a recipe for quails with chestnuts, so I decided to do something similar but with a few changes – like adding some bacon to the recipe and using chicken. I could possibly have bought quails in the farmers’ market on Saturday – certainly there were pheasants – but I’m not a great game fan. I like pheasant but it has to be well cooked or easily dries out and, of course, there is the shot to deal with: a potential tooth hazard! I remember once trying grouse in the famous Rules restaurant in London where my parents occasionally took us for a treat. It was just too strong for me but my kind dad swapped dishes. And this was only a few years ago, not long before he died, and I was definitely very grown up! I therefore settled on buying a chicken from the excellent Boarstall Meats stall. I’m becoming quite expert now at jointing the chicken using my son’s instructions – Jonathan’s Masterclass – and the boning knife he bought me. ‘The knife is brilliant and makes all the difference,’ I told him last night as we were about to eat. ‘I know,’ he said, ‘and I knew you wouldn’t bother to buy one for yourself.’ It’s so good to have sons keep you in order in the kitchen! 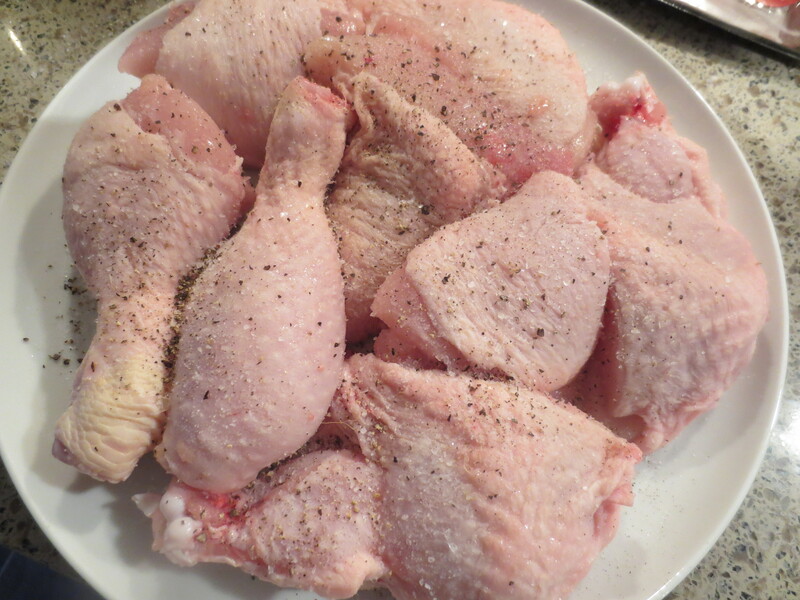 I jointed the chicken into 8 portions. 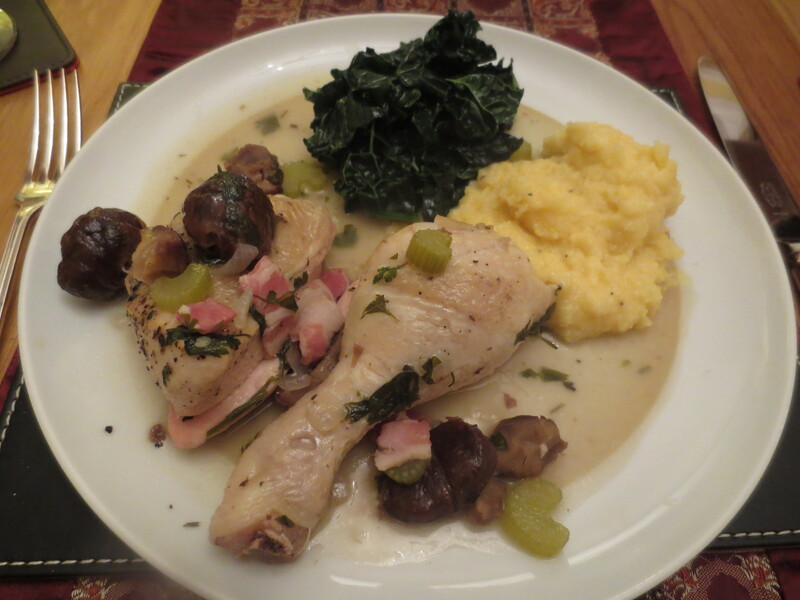 I did this earlier in the day so I could get a stock cooking – which I also used to make some celeriac soup. Thus I had some good, tasty fresh stock for my chicken dish. 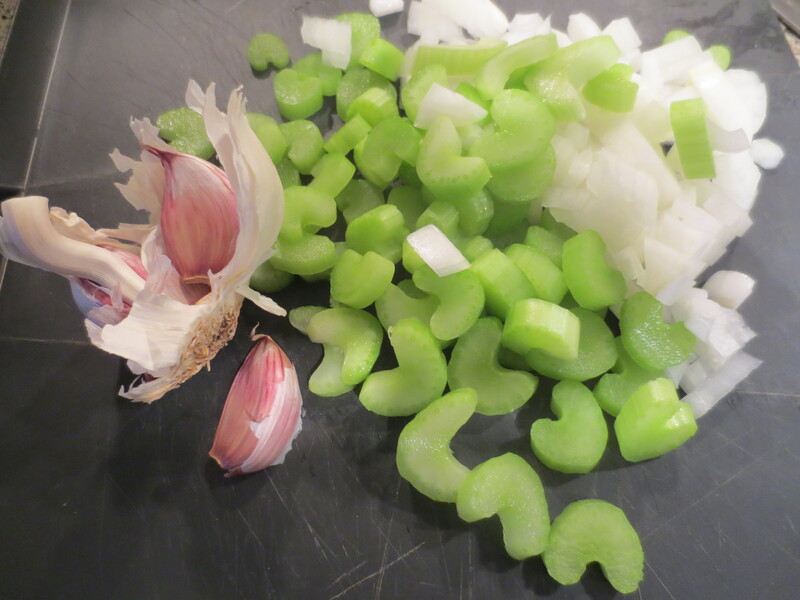 I chopped 1/2 large onion (I only had huge Spanish ones in my fridge), 2 sticks of celery and crushed 2 cloves of garlic. Then I sliced 4 rashes of streaky bacon into small pieces. 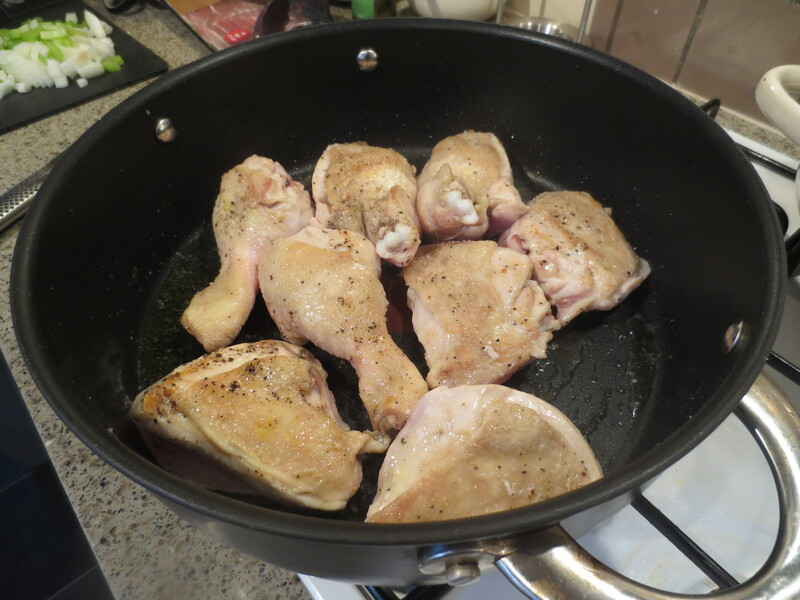 First I seasoned the chicken pieces with salt and black pepper and browned them in a large pan in some olive oil. Then I removed them to a plate and tipped the chopped vegetables and bacon into the pan. Add a little more olive oil if you think it’s necessary. 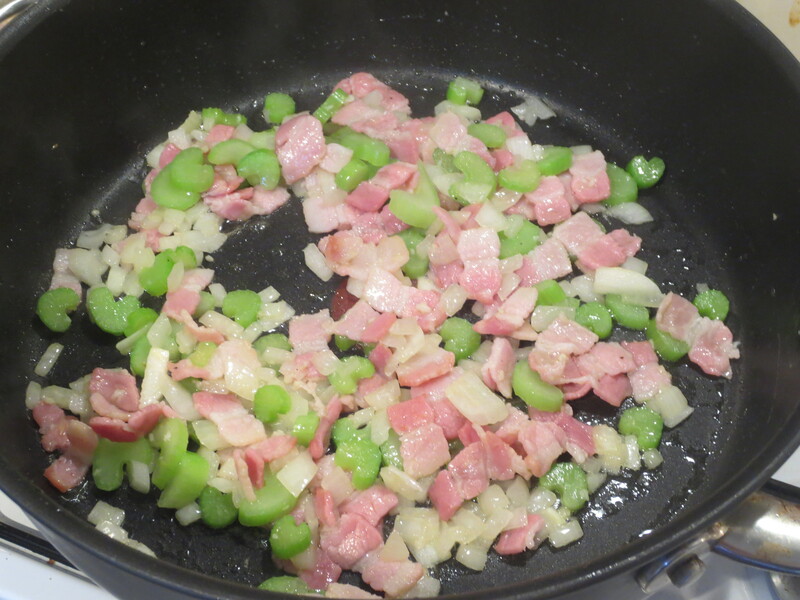 Cook over a medium heat until the bacon has browned slightly and the vegetables are softening. Now sprinkle over a tablespoon of plain flour and mix in. I wanted to thicken my sauce a bit. 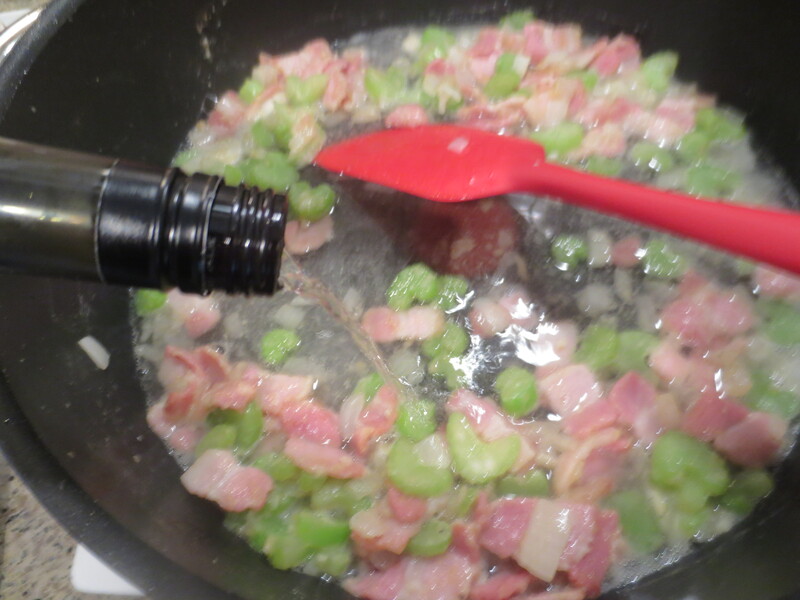 Next I poured in one of those small individual-sized bottles of white wine (about 200-250ml) and stirred until smooth. 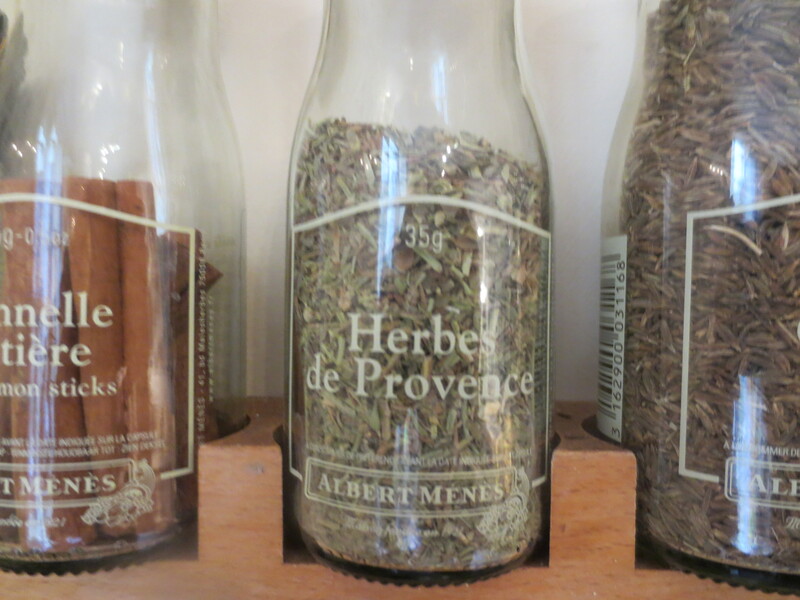 I also added some Herbes de Provence that I brought back from France in the summer. My fresh herb supply isn’t looking great now that winter is here. I let the sauce bubble for a couple of minutes then added a few ladlefuls of hot chicken stock – about 250ml. 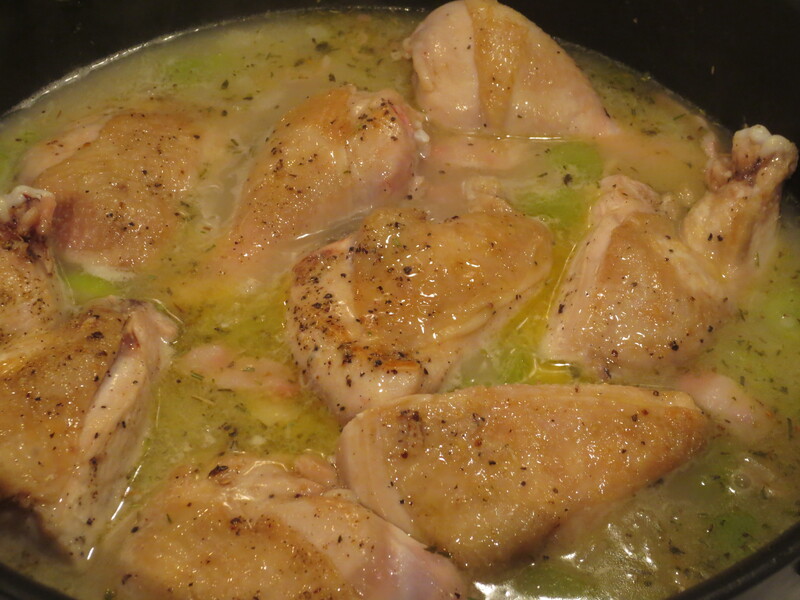 Once that was mixed in, I put the chicken pieces back in the pan and then turned the heat down to a simmer, put the lid on and left for 15 minutes. Then I added the chestnuts. The pack was a 200g pack and I’d only had 4 out for the pasta so there were plenty left. I also added a good handful of chopped fresh flat-leaf parsley. Then I covered the pan again and cooked for about another 30 minutes, until the chicken was tender. Check seasoning before serving. I served the chicken with some soft polenta seasoned well with plenty of salt and black pepper and some Parmigiano cheese. I flash-fried some cavolo nero as another side dish, drizzling over some olive oil and a little lemon juice. It was all very delicious. 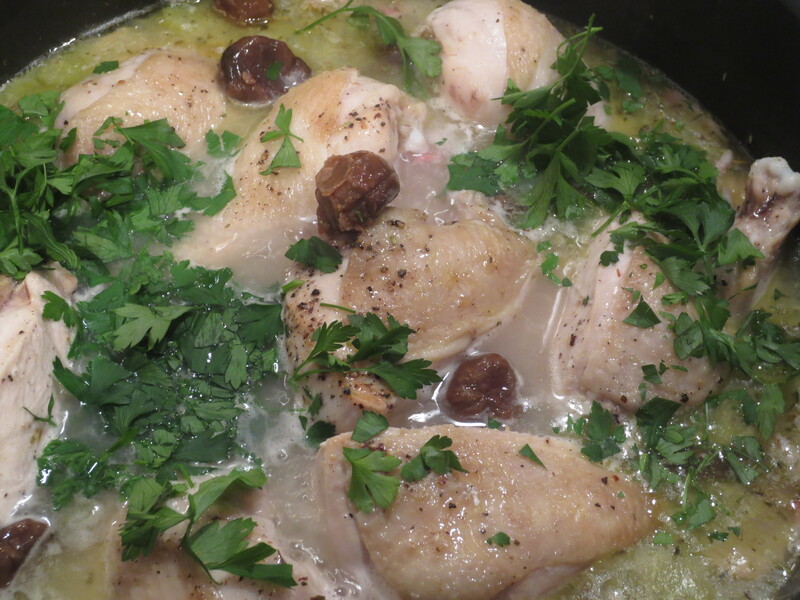 The chicken was beautifully tender and the taste rich with wine, herbs, chestnuts and celery. A piece of sweet, nutty chestnut eaten with a slice of chicken was gorgeous and made such a good partnership. ‘It’s a bit Christmasy,’ said Jonathan, and certainly it would make a great alternative Christmas meal to the usual turkey. Your meal indeed would be perfect for Christmas…it sounds delicious. Many thanks, Karen. I’m pleased you like the sound of it.